Alpine vegetation is considered to be particularly sensitive to climate changes. 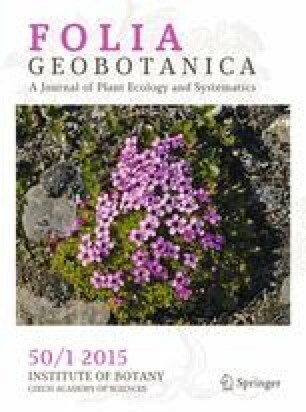 Here we document changes in species richness, distribution and composition over the past 50 years by resurveying vegetation in Rondane, a well-studied alpine area in central Norway. We estimated changes in species occurrences, species richness and species’ realized optima to study relationships between vegetational and environmental change. We used a weighted average approach with elevation and indicator values for light, temperature, pH, moisture, nutrients and tolerance to snow-cover duration. Permutation tests, allowing for unequal sampling in the original survey and the resurvey, indicated whether vegetation changes were statistically significant. We found no significant change in the average number of species per plot since 1950. Of 21 species analysed for changes in frequency and realized optimum, ten showed statistically significant changes in frequency (six decreased, four increased), and six exhibited statistically significant changes in their optimum along the soil-pH gradient. Statistically significant optimum changes were found along the nutrient and light gradients (three species) and the elevation and snow-cover gradients (two species). No statistically significant changes were found along the temperature or moisture gradients. In comparison with other studies, our results suggest that recent climate changes have had a relatively low impact on alpine vegetation in the Rondane mountains. This is indicated by our species optimum analysis, which revealed few changes along gradients that can be directly linked to the climate (temperature and soil moisture) whereas most detected changes appear to be responses to factors related to soil pH. The relative constancy of species’ optima and hence species composition may be explained most parsimoniously by the species pool in the Rondane area, which consists largely of common and widespread species with wide ecological amplitudes and hence broad tolerances to environmental change. The online version of this article (doi: 10.1007/s12224-015-9209-9) contains supplementary material, which is available to authorized users. We thank Radim Hédl and Arvid Odland for comments on an earlier draft. The field work was funded by the Faculty of Mathematics and Natural Sciences, University of Bergen. The research has received funding from the Polish-Norwegian Research Programme operated by the National Centre for Research and Development under the Norwegian Financial Mechanism 2009–2014 in the frame of Project Contract No. Pol-Nor/196829/87/2013. We are grateful to Petr Šmilauer and three reviewers for their helpful and constructive comments and suggestions.